There are many different adjuvants in the market place that can help break the surface tension of water and spread out spray materials on plant surfaces. The same ones may also be used to help stick them to plant surfaces. Just a few are shown here. Retailers sell well over 300 registered adjuvants in Washington State. In other Pacific Northwest states where registration is not required, retailers sell from 400 to 500 adjuvants. Properly applied adjuvants can increase pesticide efficacy (allowing for reduced pesticide use); overcome adverse environments; minimize loss via evaporation and drift; lessen environmental hazards; and improve economic returns. However, adjuvant label claims may not be validated by research. While all claimed uses should result from the favorable outcome of performance tests, most don’t; they simply reflect the formulators’ market research. Adjuvants are not regulated by EPA other than being exempt under CFR 40 180:1001(c) or when mentioned on a pesticide product label. Consequently, adjuvant labels, unlike pesticide labels, can make any claim. Only adjuvants whose value is supported by data derived from university or independent research are discussed in this section. Adjuvant terminology is not standardized and is often confusing. In some cases, when one manufacturer stops making an adjuvant, another picks it up and formulates a similar product under the same brand name. For example, a spreader that originally was formulated as a nonylphenol ethoxylate surfactant with an isopropyl alcohol cosolvent is now a mixture of nonylphenol and linear alcohol surfactants with a glycol in place of the low molecular weight alcohol. Consequently, data pertaining to the earlier formulations do not apply to the current product. Formulators normally include two or three ionic and nonionic surfactants in their pesticide products. They add these for at least four reasons: formulation stability, dispersibility, emulsifiability, and efficacy. For instance, products stored for long periods of time or in extreme temperatures must not separate. Adjuvant surfactants help stabilize formulations by keeping ingredients together. A product poured into a spray tank should disperse readily in the water. Poorly formulated pesticides may flocculate, aggregate, sink, or float. Surfactants act as dispersing agents to prevent this. Most pesticides are oil based and require emulsifying surfactants, which form a “bridge” between unlike chemicals that don’t mix readily. Leaves are covered with a cuticle that protects the plant from the environment and from foreign materials, including the active ingredients in most pesticides. Penetrating surfactants expedite movement of the active ingredient through leaf cuticles and other morphological structures. For optimum performance, surfactants should be tailored to the active ingredient and the crop characteristics. However, surfactants are designed to be efficacious for a variety of pesticides and crops, as it is impractical to develop crop-specific products. A pure surfactant does not mix readily in water; instead, it sinks to the bottom of the spray tank. Co-solvents improve dispersion of the surfactant in water and also can serve as “couplers” to hold formulation components together. Manufacturers in most parts of the world have eliminated the practice of using low molecular weight alcohols as inexpensive fillers, because their presence would require a statement of flammability on the label. This would lead to additional requirements for storage, handling, and transportation, and, sometimes, increased insurance costs. Spray droplets containing low-molecular weight alcohols tend to dry more quickly, reducing a plant’s uptake of many chemicals. These alcohols (isopropyl and butyl alcohol) in the formulation also increase the quantity of very small droplets, which increases loss by evaporation and drift. Traditional surfactants are designed to spread an active ingredient or enhance its penetration into the plant cuticle. However, so-called super-spreaders may be superior because they can move an active ingredient deep into the crop canopy or into microhabitats within the leaves and stems. For example, a study on eyespot disease in wheat indicated that an organosilicone surfactant moved the fungicide down the stem to the base, where the infection attacks. Only with this super-spreader did the fungicide significantly lower the incidence of eyespot. Contact insecticides, as opposed to systemic types, normally do not require surfactants to control large, mobile insects. Insects ingest or absorb sufficient quantities of toxicant while moving about. Contact insecticides used to treat small or immobile insects (mites, thrips, scale, aphids) benefit from the addition of traditional or organosilicone surfactants. Organosilicone surfactants are especially useful in moving toxicants to difficult-to-reach insect and disease pests. These surfactants also work well on particularly difficult-to-wet plants such as onions and cabbage. 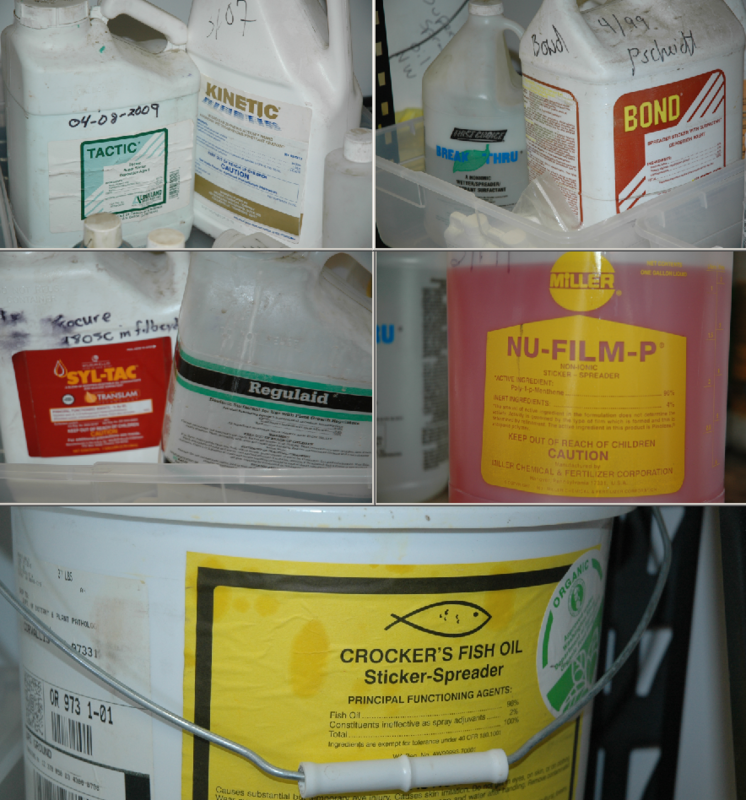 Earlier handbook versions maintained a laundry list of many adjuvants sold in the Pacific Northwest. However, many have been tested only when used with herbicides; therefore, they are not included in this publication. Esterified seed oils, crop oil concentrates, and tallowamine surfactants are exceptionally damaging to cuticles as are most spreaders applied at high concentrations. Manufacturers often recommend surfactant rates at too wide a range to be useful. The surfactant in the tank must reach well above the critical micelle concentration before it becomes effective. To reach this level, traditional non-ionic surfactants usually require about 1 pint active ingredient per 100 gallons of spray solution. For normal foliar applications, adding more than 4 pints per 100 gallons will not improve performance. It seems logical that the more a chemical is spread across the leaf, the more it will penetrate into the leaf. In reality, better spreading is not necessarily indicative of better penetration. Increasing the contact area of a deposit would seem to aid in the diffusion of a solute through the cuticle. However, experiments using applications of single droplets have demonstrated no general correlation between the surfactant-induced uptake and the apparent contact area of the corresponding deposit. Stickers affix wettable powder (as well as flowable insecticides and fungicides) to the leaf cuticle and other plant surfaces. However, stickers offer no “sticking” value to emulsifiable concentrate (EC) formulations, as EC formulations partition into the cuticle. Stickers fall into three types: polymers, oils, and lotions. The major polymers are pinolene resins and latex; oils include drying oils and waxes. Oils and waxes work better on waxy cuticles, while polymers work better on plant surfaces with low wax content. Products like Tactic (a latex + organosilicone surfactant) are designed to provide coverage in hard-to-reach areas of plant structure (insect and disease microhabitats), particularly in cole and allium crops. The lotion Cohere does not “stick” the product to the leaf surface. Instead, it incorporates the product into the upper regions of the cuticle, enhancing rainfastness. Water hardness and pH often cause confusion. Hardness refers to the minerals in the water, and pH measures the degree of acidity or alkalinity. A pH of 7 means water is neutral. Water with a pH less than 7 is acidic, and water with a pH greater than 7 is alkaline (basic). The pH of natural waters in the Pacific Northwest generally ranges between 4 and 10. The pH of waters west of the Cascade Range generally ranges from 4 to 7, and pH of waters east of the Cascade Range generally ranges from 7.2 to 9.6. Hard water is alkaline and typically contains high levels of carbonate and bicarbonate (> 300 ppm). The predominant pathway of pesticide degradation in the spray tank is hydrolysis. How fast a pesticide is degraded by hydrolysis depends on pH, temperature, and to a lesser degree water hardness. Pesticides vary widely with regards to their stability to hydrolysis. For those that are susceptible to hydrolysis, extremes in pH and temperature usually result in more rapid degradation. How fast a pesticide degrades is often expressed as half-life: the time it takes for half of the original amount to degrade. Table 4 summarizes the stability of a variety of pesticides to hydrolysis. Note that some pesticides degrade faster under alkaline conditions and others under acidic conditions. The half-life values shown are for temperatures around 25°C. Generally, degradation rates double for each 10°C increase in temperature, and vice-versa. To protect against rapid loss of pesticide active ingredient in the spray tank, it may be necessary to add a buffer. Spray tank buffers are designed to maintain a reasonably constant pH, whether the water added is acidic or alkaline. Table 4. Stability of Certain Pesticides to Hydrolysis.